Recover a Remembered Wi-Fi Password - Ask Leo! If you forget your network's Wi-Fi password, but you're still connected, Windows can remind you what it is. I connected to my WPA-protected Wi-Fi network ages ago, and now I can’t remember the password. How do I figure out what it is? It’s not at all uncommon to set up a wireless network securely, and then get on with your life, neglecting to write down the encryption password you created. Later, when it comes time to add another device, you’re unable to remember that all-important password. It’s so secure, even you can’t get in! If you forget the Wi-Fi password, the traditional approach is simple, yet cumbersome. Sign in to your router or access point’s administrative interface. Go visit every device that used to be connected to your wireless network, and reconnect them using the new Wi-Fi password. Conceptually very easy, but in practice, if you have a lot of devices, it can be a pain. 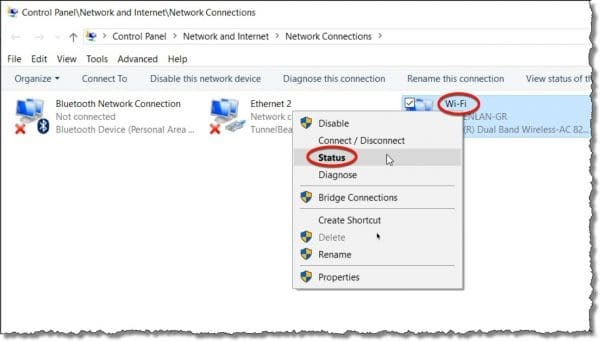 Fortunately, if you have a Windows device connected to your wireless network, you can have it show you the password. It’s not as simple, but a lot less cumbersome. In Control Panel, open the Network and Sharing Center. 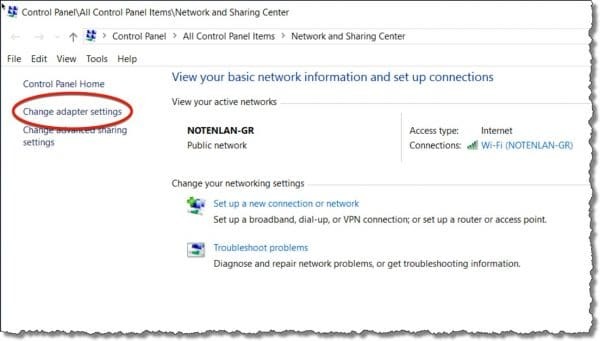 (You can right-click on your networking icon in the task bar notification area and click on Open Network and Sharing Center to go there directly.) Click on Change adapter settings on the left. Right-click on the icon representing the machine’s wireless network connection, and click on Status. 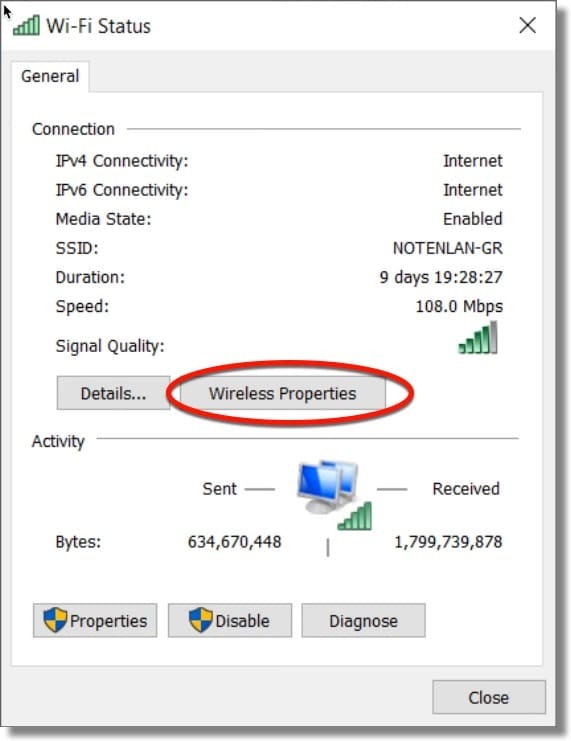 In the status dialog, click on Wireless Properties. Click on the Security tab, and make sure “Show characters” is checked. The “Network security key” you see is your Wi-Fi password. You might want to save it somewhere for easier access next time. Here’s how I never suffer from this problem. Whenever I get a new “anything” that requires a password, I write it down on a piece of paper and when I am finished setting up, I open an encrypted spreadsheet stored in Dropbox and add a new line for that device or account with all the relevant info, not just the password but account number, email login, secret question answers and any other relevant info. Just remember to also record any changes you make as soon as they happen. Password managers like LastPass are also a good place to keep this information. They often have a “secure note” feature where you can keep any information you like. Yes I agree defiately would use LastPass which is encrypted which won’t be the same in dropbox making using Dropbox much less secre. I downloaded it and tried it out. It showed several LAN passwords, but the funny thing is, the computer I tried it on is a desktop which connects via LAN cable, not WIFI. The logins were done on my laptops, some even in other countries. Those laptops were turned of when I ran this, so it can’t be something over the network. Does anybody have an idea how something like this can happen? The moral: we have no clue what information our devices are collecting or where or how that information is stored and shared. I feel Microsoft has gone too far with that one. Well, now my go everywhere machine is Linux. I still need one Windows machine, not because of any proprietary programs. I just need to keep my Windows knowledge up to date for my work on Ask Leo! To be fair, there’s no reason to assume they’re stored unencrypted; you were able to access them while logged into your account, which means that you’d already passed a username/password challenge (or whatever else your Microsoft account is set to use). I would HOPE that they’re stored encrypted. But you’re correct, could be otherwise. One reason I fear that they unencrypted is the fact that a third party program showed them. I have a hard time believing that Windows decrypted them. It could be encrypted to non-logged in users. Encrypted using some account information that’s available on when the user logs in. I used the magical Jellybean Wifi password finder, and it saw all the wifi points I have access to, but did not find one password. I then downloaded the non Wifi PasswdFinder, and it did find 3 of my passwords to some websites I access through ms-ie, but that was it. I feel I am doing a great job on keeping my system secure, if that is all it could find. I do the save password to a protected excel doc that I backup to multiple places (only need to memorize 1 password, although I do know many that I use more often). I don’t usually let any system save my password, because if a program like this can get at it, then someone else can maybe get at it through some nefarious means. Am I overly cautious? You betcha! Especially after I see all these companies that get their customer list passwords lifted. Caution: wifi-password-revealer downloaded from the magicaljellybean.com site has OpenCandy PUP in it. The option to show characters was greyed out in Vista. I’m guessing that my dad set up my mom’s laptop with a limited user account since my mom is not so computer savvy. Now without access to an administrator account, I can’t get in to see if it would work. We ended up setting up a new password and reconnecting mom’s laptop. We also connected my Windows 7 laptop on to mom’s Wi-fi, so if the password ever gets lost again, I can find out the password. Show characters works well for me. When I got to this step, “Right-click on the icon representing the machine’s wireless network connection, and click on Status,” Status is dimmed. I have three computers on my network. When I repeated the steps on another computer, I was able to complete your steps. Thank you. I have no idea why one computer has Status dimmed. I simply go to the wireless router provided by att and the password is preprinted on the label. No reason to change it when you install. It’s very secure. I have a question regarding my gmail. I have a laptop as well as a desktop PC. Up until a few days ago I could access my Gmail account from either computer using the same password. But now , suddenly, I can only access my mail on only one computer. I had to change the password at first, and then it worked. However, when I tried to get into my mailbox on the other one, I was told it was the wrong password. So I tried to use the new password I used on the other machine, but it wouldn’t let me. I had to enter another new password which allowed me to access the mailbox. But now I couldn’t get into the other one, So what is going on, and what am I missing here? How do I get back to being able to use both computers with the same password like I did originally? Forget about trying to contact Google! The only way I can is to answer the questions that come up while changing passwords. Then I click on where it asks you to get a Code to verify that it is really you, which I did, each time, like maybe 4 or 5 times! I finally gave up. I am frustrated to say the least. Can you help me to get this sorted out please? I would be extremely thankful! Perhaps many others out there are experiencing the same thing, and your answer would benefit them as well. What you’re describing shouldn’t happen, of course. But you’re not providing enough information to narrow down the problem. I assume you’re using a browser to access you gmail, as opposed to an email application, such as Outlook or Thunderbird. Here are a some things to try to narrow down the problem: Clear your browser cache and cookies, and clear any “save password” feature of the browsers. Try a different browser on the machine where you can’t get into gmail. Try on a third computer. Have you recently changed settings on your gmail account or browsers? Check back to see what you may have changed. One thing that could have occurred is that somehow you got into using an “app-specific password” on your Google account, although that should not impact accessing gmail from a browser. You can always try reinstalling your browser. If you haven’t re-booted your computer, like forever, try rebooting. If you’re using Windows 10, then who knows what could be happening. Of course, there is the possibility that your account could have been hacked. Good luck. 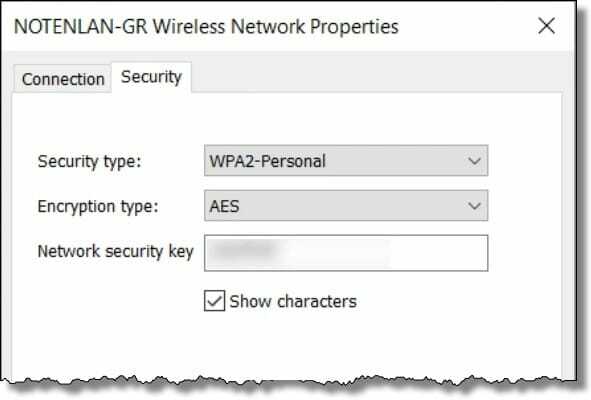 If the device is still connected or if you can connect by hardwired ethernet, just go to the wireless section of the router/ap control panel and read what the passphrase is. You find out what the IP address is by the ipconfig command in a command prompt window. You will get something like 192.168.1.23 and a default gateway of 192.168.1.1. Typically the gateway is the router. Then you type this address in to your web browser and the control panel login comes up. Other typical addresses might be 192.168.0.1 or 192.168.254.254. See http://www.techspot.com/guides/287-default-router-ip-addresses/ The login username and password is typically admin and admin, or admin and password, or admin and a blank password.